Manesa, my friend today sent me some photographs from her visit to ‘Koti lingeswara temple‘, about 100 KM south of Bangalore. 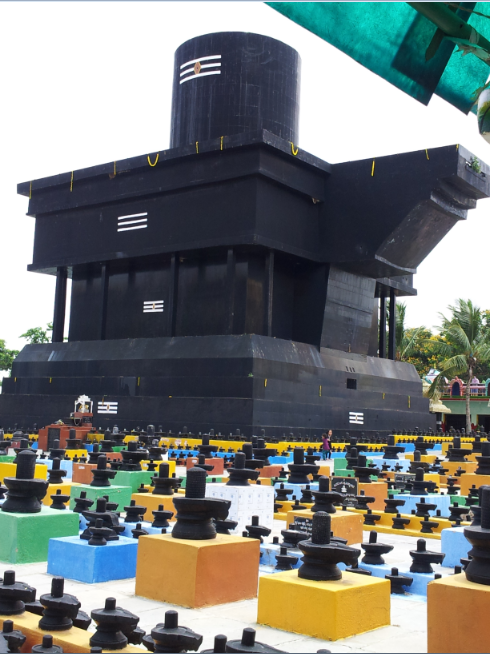 The literal meaning of the name”Koti lingeswara’ is the ‘lord of 1 crore shiva lingas’ and the temple boasts of the largest Sivalinga (108 feet) in Asia. Shiva lingas are worshipped as representations of Lord Shiva and considered very sacred by the Hindus. The literal meaning of ‘linga’ is ‘phallus’, which has lead to some scholars attributing a sexual meaning to it and even referring to the Hindu civilization as ‘phallus worshippers’. Like most Indians, I too had no idea what a Shiva lingam actually meant. In yoga, Siva (the masculine energy)is the epitome of consciouness and when the feminine energy (called the Kundalini) which resides at the base of the Spine rises and merges with Shiva, one transcends Time and Space. This is what is termed as Samadhi in yoga, a state of nothingness that every yogi tries to achieve. Few months back, I was reading the masterpiece ‘A brief History of Time’ by Stephen Hawking. The chapter 6 gives a brief account of blackholes and even horizons. In simple terms, when a blackhole is formed, it does not even let light go out until a point where the light begins to bend. And here is the representation from the book. A blackhole represents the ‘void’ or ‘nothingness’ in Space. As I read this, I could not help wondering; if the human mind where to reach a state of ‘void’ (the state of Samadhi when one is merged with the higher consciousness or in simple words there exists nothing in the mind), how would the mind look like. And the answer would be that it would look like a Shiva Linga. There must be other explanations behind the shape of Shiva Linga. 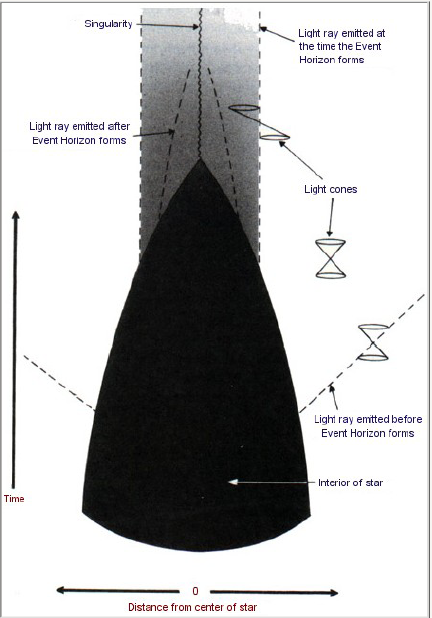 But I am inclined to believe that the ancient sages of India had experienced the state of ‘void’ and used the linga to represent it, and as there is no difference between what is inside and outside, the same representation holds good for blackholes too. This entry was posted in Mind and tagged A brief History of Time, Black Hole, Consciousness, Enlightenment, Even Horizon, Mind, Samadhi, Shiva, Shiva Linga, Space and Time, Stephen Hawkings, Void on May 27, 2013 by Sajeev. There is no dearth of festivals and auspicious days in India. 13th of May was one such. It was the auspicious “Akshaya tritiya”, the third day of the bright half of Vaishakh month (April-May) important for both Jains and Hindus. The belief for ages has been that any activity initiated on this day is bound to meet with success and it has been a custom to perform pujas, make charity or worship Lord Ganesha or Lakshmi on this day. 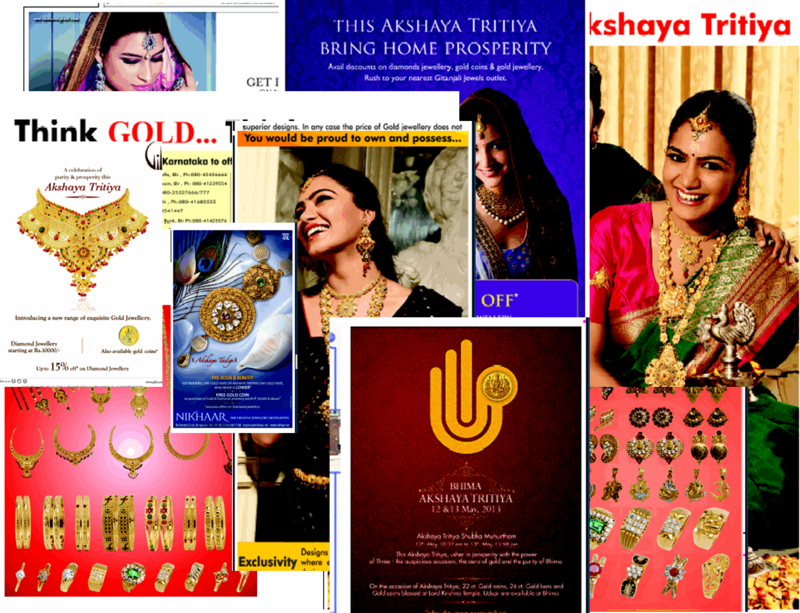 This is a collage of ads that appeared in Times of India on the May 12th, reminding you that buying gold was the most important thing to do the next day. For example, if you want to make Indians drink your cola, this is what you need to do. You can add some hints about the benefit if you choose to. Anyways if people drink so much of cola, they may not live long enough to verify them. If you package it like this, Indians will gulp down any stupid drink, eat any junk food, or use your soap or shampoo. All you need to do is keep repeating this till people believe it. This entry was posted in Culture, Life Around and tagged Absense of Logic, Akshaya Tritiya, Buying gold in India, How to market in India, Indian Consumer mindset, Indian Habits, Indians and Gold, Logic, Spiritual marketing, Spirituality, Superstitions on May 16, 2013 by Sajeev. Do we choose the good or the bad? The results of the assembly elections in the state of Karnataka (the state in India where I live) was announced today. The ruling party was voted out of power and a party that was not in power for more than a decade emerged victorious with an absolute majority. This is very typical in India. Any party that comes to power gets embroiled in corruption, scams, scandals and in-party power struggles and by the time of next elections people are fed up and look for a change. While it seems as if people chose a party to win, the truth is the reverse. People choose that a party should not win. Last week, I met a friend of mine. Both of us had gotten out of our cars and were walking towards the lift. He told me that he was planning to change his car and asked me how my car was. I told him that it was good and it was the power (128 BHP is pretty high for Indian standards) that I really liked. He had not made up his mind as to which car to buy. So we had a short discussion around the topic while we were in the elevator. ‘Why don’t you look at Renault Duster’, I said. Renault has recently launched this SUV that was doing pretty well in the market. ‘Ertiga (from Suzuki) is selling well’, I observed. ‘You can have a look at Honda Amaze’, I said. Amaze is the first diesel car from Honda recently launched in India. ‘The engine is quite noisy’. he told me. It was time for me to step out of the elevator and we had to end the conversation. I told him that there would be many more new models in the market by the time he decides to buy and wished him good luck in finding a good one. As I was walking to my apartment, I was thinking about this conversation. I was really amazed by the fact that his choice was not really based on what is good, but rather what is bad. It makes perfect sense logically. In a given set of choices, it we go on eliminating the ones based on bad qualities, we would ideally end up with the best. But then the problem is most of the good and bad are in fact pure perceptions that we carry in our head. This process of elimination works in every aspect of our lives in India, from choosing a government to choosing a life partner. While it might seem that we all tend to choose the best things in life, it could be far from truth. Our minds are actually choosing the bad ones to avoid. Or is it that we do not know what we really want? This entry was posted in Culture, Thinking and tagged Choices in life, Choosing between good and bad, How we make choices, Mind, The avoidance strategy, The process of elimination, Thinking on May 8, 2013 by Sajeev.